Don't start drama in this post and don't be rude. We'll just delete your comment if you attack anyone. hi Rob :-) eonline and Marc Malkin tweeted that Rob was at Nobu Malibu yesterday. amazing how tall all the people around Rob got...or has he shrunk? Doesn't look like him to me. Could be wrong though. Based on the more clearer pic...I would say it is him in the blurry one. same shirt, same hat. Hope he had fun. Been missing him... Have fun Rob! Can't wait for Idol's Eye, don't know why but I get a kind of good expectation about that one. :-D cheers! Rob is leaning in the corner with his head bent. The clearer picture of Rob sitting at the table. How could anyone not know that is him. He has a unique face, never mistaken for someone else. Why all the fuss? Glad that Rob could get out and celebrate the 4th. Hope he had fun. So happy to see him live a normal life once in a while! I miss him!!! I just want that hanging seat for ages! 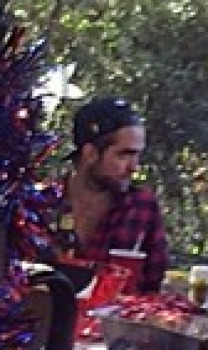 Ok, Rob could be background. Looks deep in thought. Looks good too as always. I love how normal Rob can be in the midst of these women and their outlandish posing.